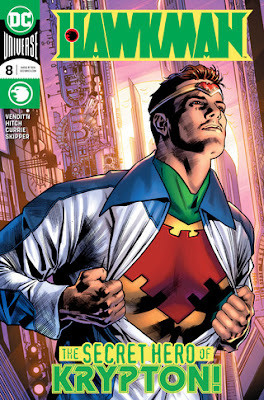 Ever since last summer when it was revealed that Hawkman was a Kryptonian in a former life, fans have been looking forward to this issue. We've been waiting to see how Hawkman has a part in the history of Superman's home planet and how that is going to help him defeat the threat that is coming to Earth. We even found out in a preview that Hawkman is now the "Living Historical Document of the Universe." 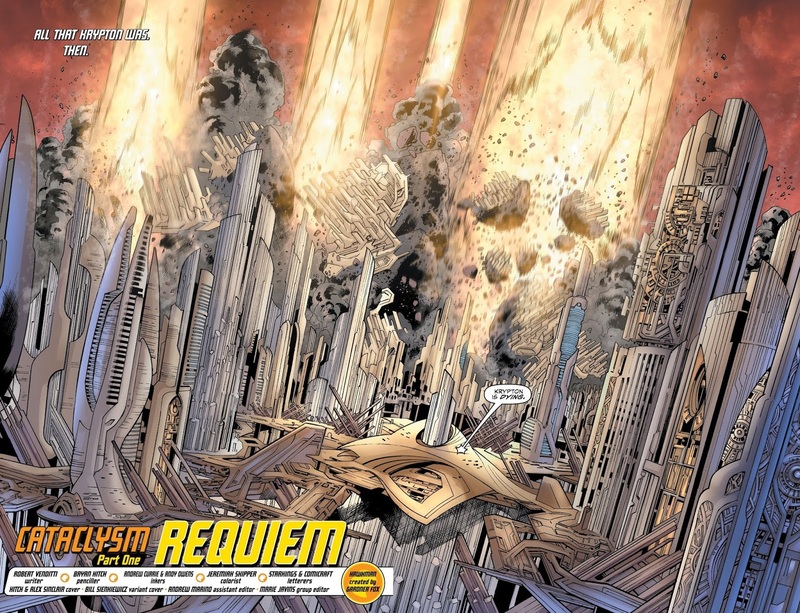 The issue by Robert Venditti and Bryan Hitch was a surprise in several ways, but maybe not in the way many were expecting. 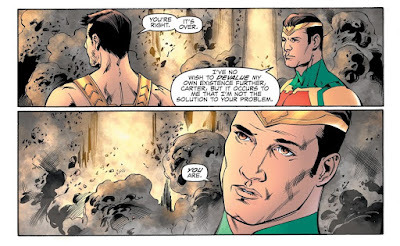 This was an issue that threw us down to the depths of despair and death, with the hope that Hawkman is going to figure out a way to soar above it all. Because that's what Hawkman is all about. Carter Hall has figured out how these time slips work after Egypt and Thanagar, and he ends up on Krypton as he hoped. But it's not a precise method, and he arrives right when the planet is about to explode, so there is a feeling of desperation and loss throughout the issue. Carter is able to meet up with his past Kryptonian self, Catar-Ol. In this encounter, we discover many things about this past life of Hawkman and some of this information is sure to come up again in future issues. But the demeanor and resignation of Catar-Ol in the face of the cataclysmic destruction left the biggest impression on me. 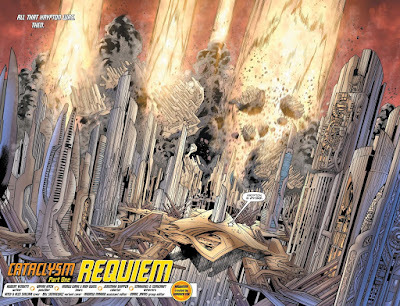 When Carter slips through time and runs into Catar-Ol, the Kryptonian is waiting to die. The planet has already begun its final destruction and while there is a feeling of urgency and panic in the scene around him, Catar-Ol remains calm. He seems a bit surprised to hear about the son of Jor-El and one of his students, and even shows Carter the weapon he had prepared to defeat the coming enemy, but he seems to have accepted his coming death as a person who has experienced it many, many times before. Death leaves a mark on a person. Most of us have experienced a death of someone close to us, and wonder what it will be like when that time comes for us. When the death of a close one happens, it shocks and numbs us for a while, but we continue on with our lives and we eventually learn how to deal with it in our own way. However, there is a sense of loss, bittersweet memories, and a scar that never truly goes away. It's no different for Hawkman. Death after death has left countless scars on the man. In this issue, Hawkman talks about the amazing hope that Superman represents, and how inspirational it is. But when he talks about himself, death is the prevailing theme. As he says, "Death is the story of my life." This was rather shocking to me. Since I fell in awe with Hawkman many years ago, he has represented many things. While he was never the most powerful superhero, he was the character who represented flight, freedom, and the strength of a hero who believes he will prevail in the end. To see Hawkman in such a resigned state was a bit depressing. 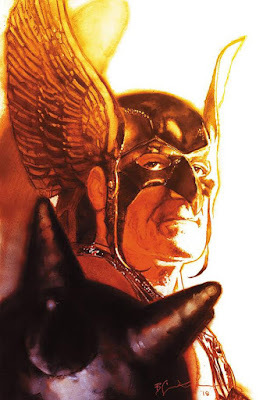 I had to sit back and think about this character called Hawkman. How strong is this man to experience death so many times, again and again, and still find the will to fight back? What sustains him? What helps him avert his eyes from the pain of death and look at the hopeful things instead? In the past issues, we've seen some of those things; his network of friends, his love of exploration and discovery, his memory of Shiera, and his friendship with Ray Palmer. This is a hero who has countless scars and when he dwells on those scars, he can be pretty dark and gloomy. But after reading this issue and thinking about it for a while, it's clear that his ultimate goal is to defeat the Deathbringers, and by doing so, protect the things that give him the strength to look away from all the death that has wounded him and give him the will to keep his eyes on hope. When Carter was talking about Superman, he almost seemed to be looking down on Superman's hope as a sign of naivety and ignorance. Hawkman and Superman may have different sources of hope but in the end its the same hope. This issue's central theme was death, but there is another underlying theme running through this story. Hawkman is a hero who is made to soar, and he fights to protect the things that give him the strength to overcome the pain and loss and fly as high as he can. This issue made me want to follow Hawkman on his journey, to see how he is going to defeat the threat of death and hopelessness in front of him and find that hope. I want to find out how he finds a way to soar. And I know he will. Because he is Hawkman.